inVerse Graphics creates 3D designs for the metaverse. It s about melting art, tradition with futuristic designs. Taking guidance from nature, inVerse creates houses and 3D buildings for Second Life metaverse residents. Their unique selling proposition is to have high detailed textures with low prims and low impact on land. The creations elaborate a mix of modern and traditional lines imparting value and meaning. Their creativity is not limited to metaverse. they develop trademarks brand signs, websites for clients outside the purview of metaverse. Developing new brand logos and improving existing ones helps their customers have an impressive visual identity. Please tell us when and how did inVerse Graphics start? inVerse is a project born in Italy in 2008. Previously it was called “Inside Studio“, which became “inVerse” two years ago. Behind inVerse, there is a group of people with a passion for graphics. How many members are there in your crew? Tell us some interesting facts about each member of your crew. We are a graphic design company that employs external collaboration as needed. Some of our collaborators work exclusively out of Second Life. Our avatars in Second Life are used as needed. So, behind each avatar there is not a single person. Generally each avatar has a role. inVerseBuilder and Tiago Morales create the models. Novocaine Islay, our main avatar is responsible for renders and textures.Customer Care manages the inVerse in-world. Jo Faith coordinates the work. Axel Bergan builds less complex models and textures. And we have Eliah Tank for scripts. Do you work from single place or operate from different places? We work in remote and some of us have never seen each other. Which milestone is the most memorable to the team as a whole? Certainly the Hollywood. It was a house that has revolutionized the houses market in Second Life, ready to use, equipped with furnitures, animations and a reasonable price. It was on the first spot in the market place for a few weeks. Are you there in other MMORPGs like Second Life? inVerse also works out of Second Life in different projects. But we hope to be in Second Life for the next few years. Second Life is a very exciting place to work. Could you tell us which graphic software do you use to create those stunning objects? Mesh are built mainly with Blender. Textures are made in Blender or in photoshop. Would you like to share something about your clients? Our customers are incredible. Many of them send compliments and give the incentive to keep going. Others are real collectors and have all out work. Our customers are our strength. What would you like to say to young creators? Can they join hands with your team? If so, would you like to guide them? Working in gaming projects is hard. Create realistic objects having the limit to use low poly mesh is more difficult than building them in high poly. Very often you have to manipulate the textures very heavily in Photoshop. This kind of work creates an important background that opens all the doors of graphics. Currently we have a very good team. Unfortunately in Second Life you have to work in 4x. So usually we are forced to reject young creators because of the time. In future we hope to be able to change the things. What would you like to tell your fans and customers? Only thanks, really thanks. Their encouragement and their positive response to our work in an incredible stimulus. Thanks to them, we won the AVI Choice Awards as Best House Builders. The interview is copy-pasted as is other than a few spelling mistakes. The interview was done at 10:30 pm IST, 9th February, 2014. I have taken the interview with my real name Debdatta Bhadury. This time I had the privilege of interviewing one of the team member of inVerse Graphics. I had approached them on Facebook Page. I was kindly redirected to reach out to “info@inversegraphics.net”. That is when I learnt there is a team behind each avatar. The answers have been told by Alessio, a team member. inVerse is not only good at designing 3D buildings but also apparel, avatar components, building and object components, home and garden. The fan following in facebook page of 1372 likes itself is an indicator as to its popularity and the quality with which it delivers. The items on sale in market place range from L$ 0 to L$ 1000. However, most of the products lie within the range of L$ 100 to L$ 500. 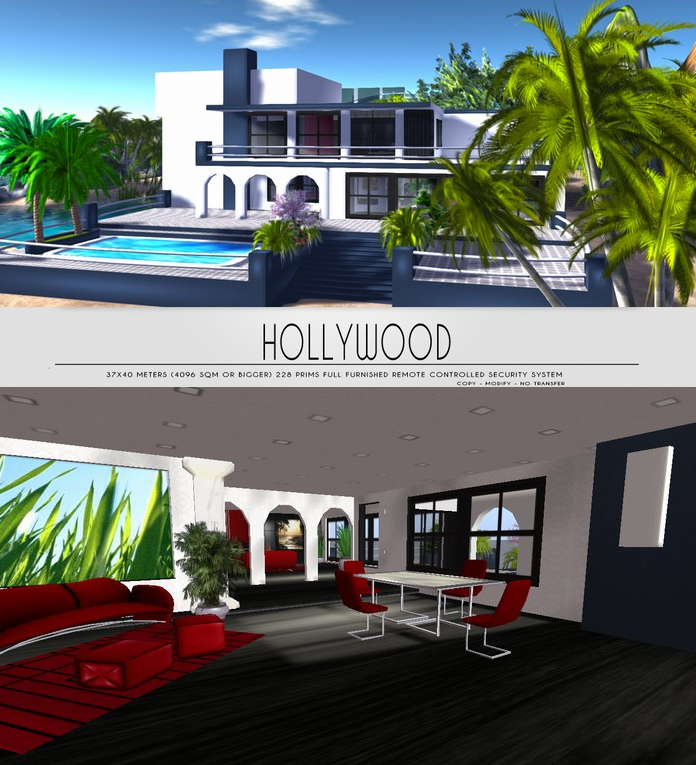 The Hollywood House (created in 2010) is in market place at L$ 199 only. To look at all its creations and buy your dream house visit the market place. I would like to take this opportunity to thank the whole team of inVerse Graphics for their time. Your fans and I hope to see many more creations in the future years to come.